In our Film Studies program at the University of Wisconsin–Madison, one of our aims is to integrate critical analysis of movies with a study of film history. Sometimes that means researching how conditions in the film industry shape and are shaped by the creative choices made by filmmakers. We also study how filmmakers draw on artistic norms, old or recent, in making new films. This effort to put films into wider historical contexts is something that you don’t get in your usual movie review. Take, yet again, La La Land. Awards and critical debates continue to swirl around the surprising success of this neo-musical. Two entries on this blog have already considered what the film owes to 1940s innovations in Hollywood storytelling (here) and to more basic norms of movie plot construction and the classic Broadway “song plot” (here). But there’s plenty more to say. Enter three Madison researchers as guest bloggers. Kelley Conway is an authority on the French musical from the 1930s to the present and author of an excellent book on Agnès Varda (reviewed here). She also gave us an earlier entry on films at the Vancouver Film Festival. Today, in an oblique rebuttal to some complaints about the principals’ singing and dancing in La La Land, she situates Damien Chazelle’s film within a trend toward “unprofessional” musical performance. Eric Dienstfrey studies developments in acoustic technology and how those have affected the way movies sound. In his contribution, he traces how film’s recording methods shape the auditory texture of the numbers, with special attention to the soft boundary between diegetic (story-world) sound and non-diegetic sound. Amanda McQueen is a specialist in Hollywood and TV musicals of the last fifty years. Here she considers how La La Land is designed to overcome audiences’ current resistance to “integrated” musicals. She proposes that it offers one way to revive the genre for modern Hollywood. These experts take the conversation in new directions I think you’ll enjoy. They remind us that a movie coming out today automatically becomes a part of history; it’s just that the history is sometimes hard to discern. Along the way they show the virtues of thinking beyond the talking points put out by the PR machine or circulating endlessly in reviews. In my view, good film criticism involves ideas and information as well as opinions, and all three are on vivid display here. Everyone Says I Love You (Woody Allen, 1998). Kelley Conway: For me, La La Land‘s references to classical Hollywood musicals and to the films of Jacques Demy provide a major source of its pleasure. (Sara Preciado’s video essay demonstrates the film’s homages) The film’s nods to other traditions remind us of something about the relationship between Hollywood and other national cinemas: mutual influence is the norm. Directors associated with the French New Wave absorbed and subverted Hollywood genres. Hollywood directors of the late 1960s and ‘70s, in turn, were inspired by the narrative ambiguity and stylistic playfulness of the New Wave. Sometimes, the influence travels full circle in quite a direct way. John Huston’s Asphalt Jungle (1950) directly influenced Jean-Pierre Melville in the making of Bob le flambeur (1956), while Tarantino’s Reservoir Dogs references both Melville’s minimalist gangster films and Hollywood heist films. La La Land demonstrates a similarly rich exchange between Hollywood and France. In 1967, Jacques Demy’s Demoiselles de Rochefort paid loving homage to Hollywood films such as Singin’ in the Rain, West Side Story, and Gentlemen Prefer Blondes. 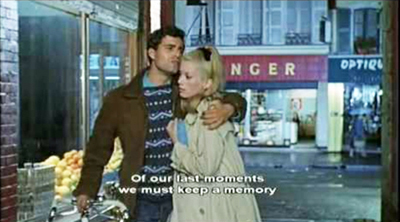 Chazelle’s film returns the favor, adopting the dancing pedestrians and location shooting of Demoiselles and the saturated colors, recitative, and downbeat ending of Parapluies de Cherbourg. Chazelle is equally smitten with classical Hollywood; La La Land brims with references to the choreography, costumes, and set design of Shall We Dance (1937), Singin’ in the Rain (1952), The Band Wagon (1953), West Side Story (1961), and many others. La La Land not only cites the style of other musicals, it also develops and tweaks narrative elements from older musicals in interesting ways. 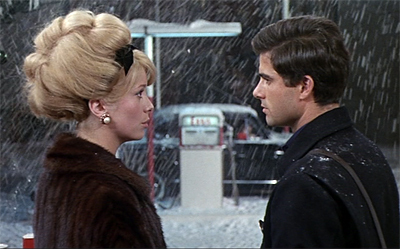 For example, Chazelle’s film, like Demy’s Parapluies de Cherbourg, thwarts the creation of the couple. In Parapluies, the Algerian war initially separates Guy (Nino Castelnuovo) and Geneviève (Catherine Deneuve). Later, an unplanned pregnancy and her mother’s machinations push Geneviève to marry a wealthy jeweler. At the end of the film, when they run into one another at Guy’s gas station, they exchange only a few perfunctory words; Guy even declines Geneviève’s invitation to meet their daughter. There is neither anger nor the warmth of nostalgia in their exchange; just a delicately drawn emotional distance that leaves viewers feeling wistful. In contrast, the relationship between Mia and Sebastian fails because they decide to put their romance on hold in order to pursue their dreams. “Where are we?” Mia asks Sebastian after her audition for the film role that will take her to Paris and launch her career. “We’ll just have to wait and see,” he replies. Five years later, he owns a jazz club and she has become an A-list actress, but she is married to someone else and has a child. When they cross paths at his club, Chazelle supplements Demy’s delicate gas station meet-up with an exuberant fantasy montage, a kind of dream ballet often used in the classical Hollywood musical, in which the couple manages to stay together. The production number is full of invention and energy, combining animation, simulated home movie footage, a trumpet solo, and a tribute to the “Broadway Melody” number of Singin’ in the Rain. As Mia prepares to leave the club, she and Sebastian exchange tender glances and rueful smiles. She departs as he launches into his next song. The love is still there, the film suggests, but Sebastian and Mia chose art over love and they would probably make the same decision today. Different from Demy’s characters, Sebastian and Mia are not victims of implacable destiny, but committed artists. It’s an ending that feels fresh to me. As Amanda McQueen reveals below, La La Land conforms to various trends in the 21st century musical. Consider just one element: song performance. Neither Ryan Gosling nor Emma Stone possesses a powerful, belt-it-out voice. Instead, much of the singing in La La Land is modest, thin, and breathy. Take, for example, the number “The Fools Who Dream,” a climactic moment in the film. Asked by the casting director to tell a story, Mia begins a poignant monologue (“My aunt used to live in Paris…”) in a quiet speaking voice marked by a bit of vocal fry. She slowly moves into an a capella ballad and, after a few bars, is accompanied by piano. Eventually, the music swells, Mia goes big (“Here’s to the ones who dream…”), and then the song winds back down to the concluding notes, delivered a capella. The staging of the song – black background, circular camera movement, a big swell of emotion, a long take – is reminiscent of the splashy production number in Agnès Varda’s New Wave masterpiece Cléo de 5 à 7. But Stone’s voice reminds me of the wonderfully whispery, intimate singing voices of Birkin, Bardot, and Karina. Because I was letting Emma lead the song, I was reacting to her. So a lot of times the piano is a little bit behind the vocal. It sounded like a recital or something where you know the singer is leading it and the piano is there to accompany. That’s what happens when two people make music together; things are not perfectly in sync. That’s why it feels musical and why it feels real and honest. Directors of many recent film musicals similarly seek to create the impression of aural and emotional authenticity, either through non-professional singing or on-set recording. Woody Allen’s musical Everyone Says I Love You (1996) employs actors who are not professional singers, and Baz Luhrmann’s Moulin Rouge (2001) uses the relatively modest singing talent of Nicole Kidman and Ewan McGregor in a mixture of playback and live recording. Likewise, publicity for Les Misérables (2012) made much of the fact that Anne Hathaway, Hugh Jackman and Russell Crowe performed their songs on the set. Christophe Honoré also tends to employ singing performances by non-singers. Here, in Dans Paris (2006), a couple breaks up over the phone while singing in a breathy, halting fashion. There is, in fact, a broad spectrum of singings styles and capabilities used in contemporary film musicals. In La Captive (2000), Chantal Akerman employs an aria from Mozart’s Così fan tutte. Two women sing to one another flirtatiously from their windows across an apartment courtyard without accompaniment. One woman is a trained opera singer, while the other, the film’s elusive female protagonist (Sylvie Testud), is untutored. The contrast in the women’s voices provides an unexpected pleasure. The use of the modest singing voice by Chazelle and others to convey emotion and authenticity is quite different, for example, from Alain Resnais’ use of song in On connaît la chanson (aka “Same Old Song,” 1997). Here, fragments of songs spanning the history of twentieth-century popular French chanson are lip-synched by actors. Like Dennis Potter, whose Singing Detective (1986) inspired On connaît la chanson, Resnais foregrounds the artificiality of dubbing. This creative choice works against the traditional commitment in film musicals (and in sound cinema more generally) to the impression of fidelity and authenticity. Here, Josephine Baker’s delicate singing voice is grafted onto the body of a Nazi commander. The humor in non-synchronization loops us right back to Singin’ in the Rain. Directors of contemporary film musicals did not pioneer the use of the untrained singing voice. As Jeff Smith reminded me recently in an email, “There is a long tradition of celebrating the raw, unpolished singing styles of rock and rollers, dating back at least to the time of Mick Jagger, Bob Dylan and Roger Daltrey, and using those marks of authenticity as a means of distinguishing them from pop performers.” Unlike the musicians of rock and punk, though, Chazelle doesn’t seem particularly interested in denigrating pop music. He clearly loves John Legend’s musical performances in La La Land and those 1980s pop tunes he pretends to mock. Many have criticized La La Land’s singing, but in fact, Chazelle is operating well within the tradition of employing imperfect vocalization to connote realism and to convey emotional power. The modest singing voices add another dimension to Chazelle’s participation in the ongoing conversation between Hollywood and French cinema. Eric Dienstfrey: I agree with Kelley’s observations about the remarkable number of cinematic references in La La Land. For example, the opening number, “Another Day of Sun,” embeds a host of influences within Chazelle’s mise-en-scène. For me, this exit-ramp romp immediately recalled the ferry ride in Jacques Demy’s Les Demoiselles de Rochefort and the traffic jam in Jean-Luc Godard’s Weekend. Amanda McQueen, below, notes how the scene reminded her of the films of Vincente Minnelli. And as Chazelle himself indicates, one might even see traces of Rouben Mamoulian’s Love Me Tonight and Alfred Hitchcock’s Rear Window. Thanks to such references, we can consider the significance of La La Land’s numbers as extending well beyond Justin Hurwitz’s melodies and Benj Pasek’s and Justin Paul’s rhymes. The film’s allusion to Rear Window, for instance, may encourage audiences to compare the onscreen chemistry between Emma Stone and Ryan Gosling to that of Grace Kelly and James Stewart. To catch these subtle references, filmgoers need to pay close attention to the camerawork, the staging, the costumes, and even the choreography. Similarly, we can discover new layers of meaning by analyzing its songs and their sound designs. How many ways are there for sound technicians to record and mix a musical number? Quite a few, it seems. One basic way is to record the vocal performances live on the set. During the earliest years of talking pictures, this technique often required the presence of an on-set orchestra to provide accompaniment from behind the camera. More recent strategies, however, merely ask singers to wear small earpieces that play pre-recorded accompaniment. Another option is for technicians to record the vocal performances in an acoustically controlled studio and then mix these recordings into the final film. Sometimes technicians will record the studio performance before filming, and then require actors to lip-synch to playback on the set. Other times, technicians will ask the singers to perform the song live on the set, but then use a studio recording in the final mix due to unforeseen circumstances. In some instances, the set might be too noisy to record a clean vocal performance, or the dance number might be so physically demanding that the actor can’t help but introduce heavy breathing and other vocalized efforts. A live recording may be ideal, but the studio recording is often the more practical solution. The musical numbers in La La Land display both recording techniques. Some were recorded live—such as “Fools Who Dream,” which Kelley discusses above—and some were recorded in a separate studio—such as “Another Day of Sun.” Steven Morrow, the film’s sound mixer, suggests that each choice was informed by various practical concerns. The acoustics along the exit ramp, for instance, reportedly made it too difficult to record live singing. Such concerns even led to strange incidents where a single song would contain a mixture of both live and studio recordings. Morrow notes how “Someone in a Crowd” relies upon Emma Stone’s live recordings, while studio recordings were used for the other actresses. This decision to blend together live and studio recordings can become a storytelling device—say, if the director wants to create a contrast between two or more characters—but for most songs, the choice to use either technique is generally determined by shooting conditions and budgetary considerations. Still, can the acoustical differences between live and studio recordings function beyond practical filmmaking needs? It is worth noting that both techniques parallel another cinematic binary: diegetic sound and non-diegetic sound. Diegetic sound commonly refers to all the dialogue, effects, and music that emanate from sources within the film’s setting, such as radios and footsteps. Non-diegetic sounds are those added to the story world as a form of commentary, such as a moody orchestral score. As many film scholars rightfully argue (here and here), the diegetic/non-diegetic binary is not perfect, but for the vast majority of films the distinction remains a useful initial categorization for sound’s narrative functions. Musicals are an exception. In his groundbreaking study of Hollywood musicals, theorist Rick Altman argues that the clean distinction between diegetic and non-diegetic sound breaks down during moments when characters burst into song. Specifically, the interaction between diegetic singing and non-diegetic musical accompaniment lifts characters out of the story world toward fantastic settings. Consider Elvis Presley’s performance of “I Can’t Help Falling in Love with You” from Blue Hawaii. In other words, this dissolve from the music box to the orchestra tells us that Elvis… well… has left the building. He has transcended the purely diegetic universe of the film’s story-world reality, and has temporarily entered a non-existent space that is supra-diegetic fantasy. Altman’s observations apply to La La Land as much as they apply to Blue Hawaii. When Mia and Sebastian sing “A Lovely Night” while searching for their cars, the non-diegetic accompaniment fades in and the two characters interact with the music through song and dance. In turn, Mia and Sebastian transcend Los Angeles and enter a supra-diegetic universe. This diegetic boundary crossing is punctuated further by their stroll through Hollywood’s hills, a vantage point which allows Mia and Sebastian to literally look down upon the city as they chart this transcendence. Yet La La Land is more than just a pastiche of earlier musical traditions. It also demonstrates how different recording techniques can be thematically integrated within the film’s narration. Here we might once again compare the playback of “Another Day of Sun” to the live recording of “Fools Who Dream.” Both numbers are similar in their reliance upon non-diegetic musical accompaniment, yet the production process creates contrasting narrative implications. “Another Day of Sun” was recorded in a studio, and the acoustical details of this studio environment—namely frequency response, microphone placement, reverberation time, and overall cleanliness of the recording—are remarkably distinct from the those of an outdoor location. These subtle textural differences produce the sense that the performers’ voices have left the diegetic space of the freeway and traveled to an unseen studio for the song’s duration. “Fools Who Dream” has the opposite effect. It was recorded live, and throughout the scene the acoustical details that shape Stone’s voice never really change. The sonic signature of the room remains audible in her vocals from the time she introduces herself to the casting directors, to the time she finishes singing. As a result, Mia does not transcend the story world; instead, the non-diegetic piano and orchestra seem to materialize inside the room. These two examples demonstrate how alternative recording techniques offer filmmakers different ways for characters and accompaniment to interact. Studio recordings specifically lift the vocals up toward the space of the non-diegetic accompaniment, whereas live performances can pull traditional musical accompaniment down into the story world. Both techniques defy the norms of realism, yet their production differences render each vocal performance with unique narrative weight. And for La La Land—a musical about two artists who wish to become famous stars while simultaneously remaining pragmatic and down-to-earth—the ways Mia and Sebastian interact with musical accompaniment can reveal if and when the characters are grounded in reality or lost in fantasy. As criticism surrounding contemporary musicals would suggest, Hollywood routinely favors live performances over other techniques. Live performances are not only valued for being more authentic, they are harder to record and, thus, a more prestigious cinematic accomplishment. This preference for live recordings, however, need not dictate how all musicals are made. A creative integration of both live and studio recordings can open up storytelling possibilities for the sound technicians and directors who wish to innovate within the musical genre. Yes, I know: it seems unlikely that many filmmakers will play with these acoustical parameters in their movies. Nonetheless, La La Land’s sound design points to the possibility that at least a few musicals will create rewarding experiences not just for visually minded historians, but for audiophiles as well. Amanda McQueen: Much of La La Land’s critical reception has focused on its relationship to film musicals of the past. As Kelley, Eric and David have all noted, much of the film’s meaning derives from its citation and revision of film and stage musical traditions. But what’s the status of La La Land as a musical in the 21st century? How does this shape the film’s approach to the genre’s conventions? The early 2000s witnessed a minor revival of the Hollywood live-action musical, a genre that had been considered box office poison for several decades. But despite the renewed interest in musicals, producers worried that contemporary audiences no longer accepted one of its key conventions: the integrated number. Integration commonly refers to those moments when characters spontaneously burst into song to express feelings or advance the plot, usually accompanied by sourceless music, as Eric points out above. Not all musicals have integrated numbers, but many critics and scholars assume that integrated musicals constitute the genre’s core. Audiences, however, were assumed to find this particular break with cinematic realism both antiquated and alienating. Moviegoers would suspend disbelief to accept lightsabers, superheroes, and wizards, but someone walking down the street and singing—no way! Fear of the integrated number has caused many contemporary musical films and television shows to distance themselves from this convention. Some musicals ensure the song-and-dance numbers are otherwise motivated. In Chicago and Nine (2010), all the songs are figments of the characters’ imaginations, while Dreamgirls (2006) transformed the integrated numbers of the Broadway original into diegetic stage performances. On the screen, there is this big gap right now that you have to cross to do a musical. At least an earnest musical, where you’re not immediately putting quotation marks on it. With its opening number, “Another Day of Sun,” La La Land unabashedly announces that this is an integrated musical, and it never qualifies that position. There are no cheeky winks at the camera, no characters asking why they’re singing to each other, and most of the songs function as pure expressions of thoughts and feelings. Mia and Sebastian are real people in a modern city, who just happen to be singing and dancing and falling in love. For Chazelle, “Another Day of Sun” functions as “a warning sign to people in the audience. If people are not going to be comfortable with it, they’ll leave right away.” La La Land thus almost dares audiences to accept and celebrate this unrealistic cinematic convention, and for a 21st century musical, that’s a somewhat rare approach to take. Yet La La Land has its own methods of rendering the integrated musical acceptable for contemporary audiences. First, there is its obvious nostalgia. La La Land’s visual style—35mm, CinemaScope, long takes and long-shots scaled to choreography—and its many allusions create a critical distance, an awareness that this type of cinema is a relic of another age. It’s not so much a throwback to studio-era musicals as it is a modern version of the auteurist musicals of 1970s New Hollywood (most of which were also resistant to the traditional integrated number). Indeed, La La Land has been compared to Martin Scorsese’s New York, New York (1977) or Francis Ford Coppola’s One From the Heart (1981). I think it’s also akin to Ken Russell’s The Boy Friend (1971), which has a lighter tone and takes a similar approach to its citations. Russell updates Busby Berkeley’s kaleidoscopic stagings with color and widescreen, and Chazelle updates Vincente Minnelli’s sequence-shots with a Steadicam. Like The Artist (2011), which tutored modern viewers in the conventions of silent cinema, La La Land is an affectionate lesson in a mode of filmmaking that is not likely to return. Then there’s the ending, in which Mia and Sebastian find success in their artistic pursuits, but only because they have parted romantically. As Kelley explains, La La Land owes its bittersweet ending to Jacques Demy’s Umbrellas of Cherbourg (1964). This gives the film a melancholy at odds with the studio era Hollywood musicals it so frequently references—films like An American in Paris (1951) and Singin’ in the Rain (1952), in which the couple lives happily ever after. By eschewing the union of its romantic couple, La La Land tempers the artifice of the integrated musical with a more realistic narrative, one that acknowledges that life does not always work out exactly the way we want. Such a conclusion is far more typical of American independent cinema than it is of the classical Hollywood musical. Significantly, La La Land does give us a traditional happy ending, but through the device of the dream ballet. One of the most overtly stylized conventions of stage and screen musicals, dream ballets generally function to convey character subjectivity, and they allow for especially abstract mise-en-scène. La La Land tackles this generic trope with the same sincerity it displays in its handling of integrated numbers. Set to a medley of the film’s musical themes, the sequence functions much like that in An American in Paris, arguably the most famous cinematic dream ballet. The sequence recaps the characters’ emotional journey and romantic relationship entirely through dance. Yet while the ballet in Paris shows a stylized version of what has actually occurred, La La Land’s presents an alternative reality where Sebastian and Mia stay together while also achieving their artistic goals. As Owen Gleiberman puts it in Variety, this “the very movie we would have been watching had ‘La La Land’ simply been the delectable old-fashioned musical we think, for an hour or so, it is.” In the end, though, the film affirms that Mia and Sebastian’s happily-ever-after is only a fantasy; when the dream ballet ends, the two part ways. The first time I saw La La Land, I found myself daring Chazelle to subvert my expectations and use the dream ballet as a device to create a happy ending. Instead of concluding the fantasy sequence with a return to reality, I hoped the dream ballet would function to re-write the narrative. To my mind, turning the imagined world of the dream ballet into the characters’ actuality would have been an interesting twist on how this device usually functions. At the same time, it would have more radically embraced the integrated musical tropes the film otherwise celebrates. Yet I suspect viewers would have found this ending contrived, and it would have been. La La Land’s critical and commercial success, I think, has depended on it keeping the model of the classical Hollywood integrated musical slightly at arm’s length. The film’s unique combination of nostalgia and realism is clearly resonating with modern audiences, but it’s also in keeping with the larger approach to the integrated musical in the contemporary moment. As long as film musicals are considered risky properties, certain forms of the genre will likely have to be relegated firmly to the past. Kelley Conway is a Professor in our department and winner of a Distinguished Teaching Award. She has written Chanteuse in the City: The Realist Singer in 1930s French Film (University of California Press), Agnès Varda (University of Illinois Press), and essays on classical and contemporary French film. She is currently at work on a book about postwar French film culture. Eric Dienstfrey is a doctoral candidate in our department. His dissertation traces how theories of acoustical fidelity shaped stereophonic technology from 1930 to 1959. Eric’s research interests include silent film musicians and the cultural history of dictaphones. He recently received the 2017 Katherine Singer Kovács Essay Award from the Society for Cinema and Media Studies. Amanda McQueen, a Faculty Assistant in our department, finished her Ph.D. in 2016. Her dissertation is titled “After ‘The Golden Age’: An Industrial History of the Hollywood Musical, 1955-1975.” It examines how the breakup of the studio system helped create several musical cycles, each aimed at a niche audience, and each designed to prolong the genre’s viability in the new marketplace. Apart from studying musicals on stage, screen, and TV, Amanda’s interested in media industries, film technologies, and genre theory and history. Thanks as well to Jeff Smith for his comments on these entries. Watch for his annual blog entry (first two, here and here) analyzing the Oscar-nominated songs and scores. This entry was posted on Saturday | February 11, 2017 at 3:38 pm	and is filed under Directors: Chazelle, Film technique: Music, Film technique: Sound, Hollywood: Artistic traditions, Readers' Favorite Entries, UW Film Studies. Responses are currently closed, but you can trackback from your own site.